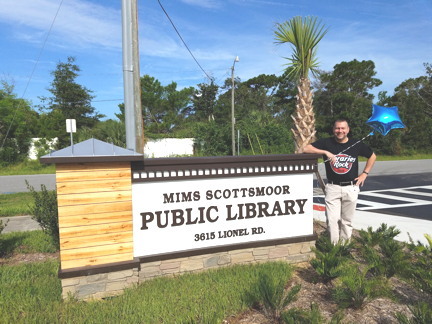 Welcome to our new Mims-Scottsmoor Public Library. 3615Lionel Road in Mims, Florida. 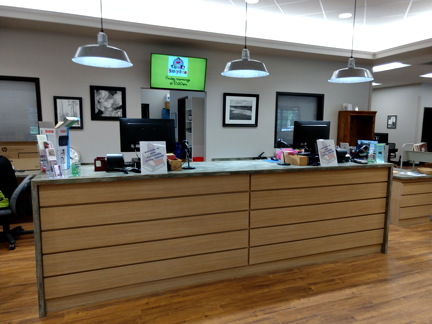 We are ready to help you at the front desk. Part of our adult collection. Note the computers for your use. 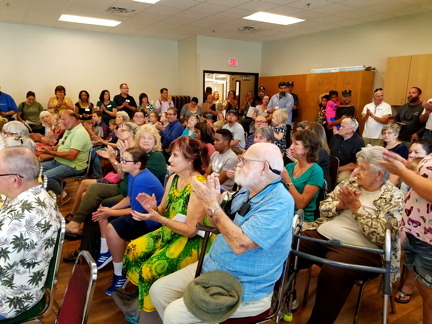 Happy citizens at the Grand Opening meeting. 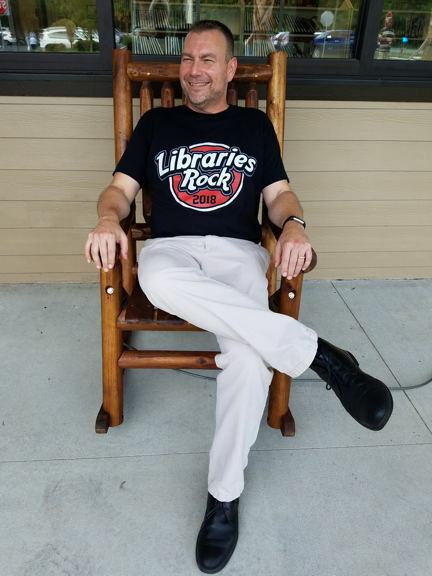 Ron Bartcher: president of the Friends of the Library. Jeff Thompson relaxing on the porch. 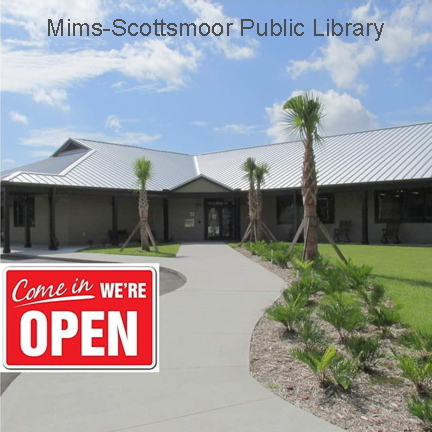 The Mims-Scottsmoor Public Library - 2018. 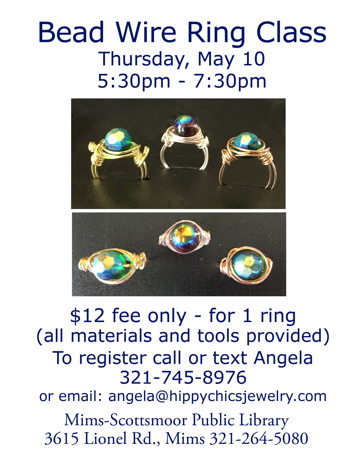 Click flyer to expand, print & share. 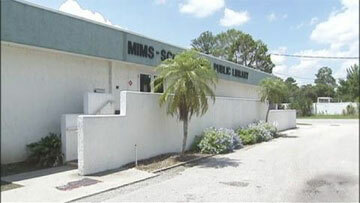 The Mims-Scottsmoor Public Library is one of the seventeen libraries in the Brevard County Library System. 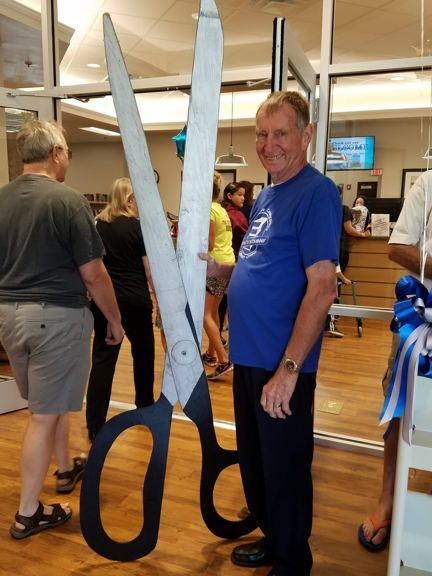 It is located on the corner of Old Dixie Highway and Lionel Road, adjacent to the Pinewood Elementary School. There are thousands of books available for people of all ages. 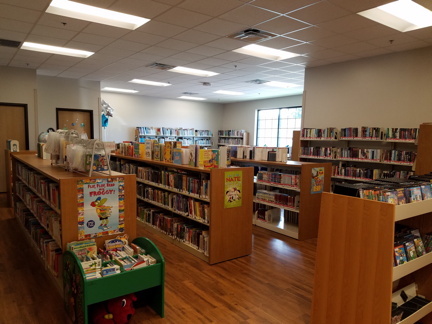 The library also offers internet connections, videos, DVD's, books on tape and on CD, musical CD's and periodicals. A wealth of useful information is also available from our library system's home page at www.brev.org. They are held on the third Monday of every month at 4:30 pm in January, February, March, April, May, September, October and November. The board does not meet in June, July, August or December. 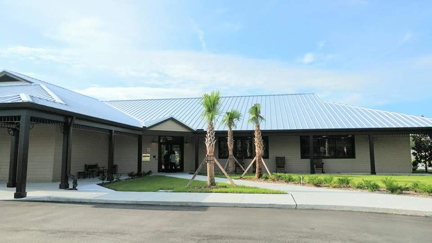 We meet monthly on the third Tuesday at 6:00pm at the Harry T. & Harriette V. Moore Memorial Center on Freedom Avenue in Mims (except in December). We meet to keep the community aware of development projects in the Mims area. The Reference Desk is the place for patrons to go with questions of any type. We help patrons reserve books and movies. We help with computer questions. We find phone numbers, addresses and information on schedules of events. If we don't have the answer we direct patrons to additional resources that may be able to help fix their problems or answer their questions. Circulation: regular print books, large print books, audiobooks (on cds, tape, and mp-3), DVD and VHS movies, eBooks, and eAudiobooks. Newspapers & magazines available for use in the library. Faxing services: $1.00 per page with a limit of 30 pages per day per patron. Resumes and job applications are faxed at no charge. Notary services: $2.00 per stamp. 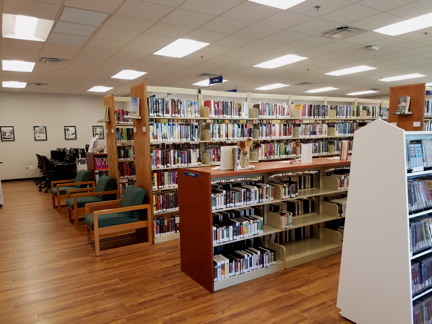 Visually or physically disabled patrons: Our Talking Books collection provides books on audiocassettes, records and in Braille which can also be delivered to homebound patrons. Proctoring services: Provided by the Reference Desk for $10 per exam. Wireless internet: Free access during business hours. Computers/Printing/Photcopy are available: Use library computers for up to 6 hours a day per patron with valid library card. 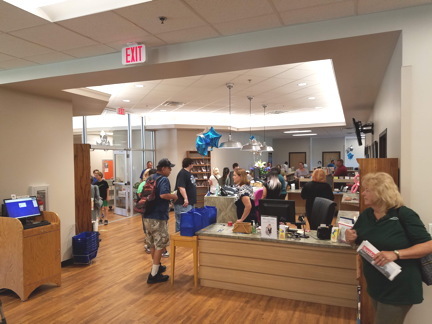 We offer temporary Guest Passes at the cost of $1.00 for those patrons who do not have a library card or who are nonresidents. Printing from the computers is available at 10 cents per page for Black & White and 50 cents per page for color. Photocopying is also available at the same prices. Visually disabled patrons: Access to an ADA adapted computer with a large screen and magnification capabilities. 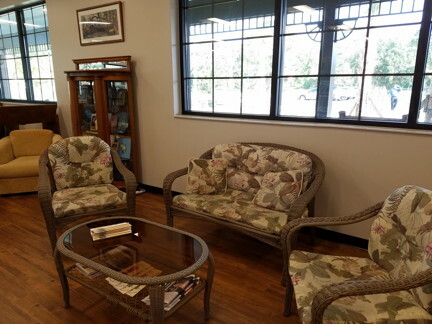 Two study/meeting rooms: Available for small groups to meet, generally available on a walk-in basis. We will try to accommodate special requests to reserve a room if you call ahead of time. The Meeting room: Holds up to 86 people. 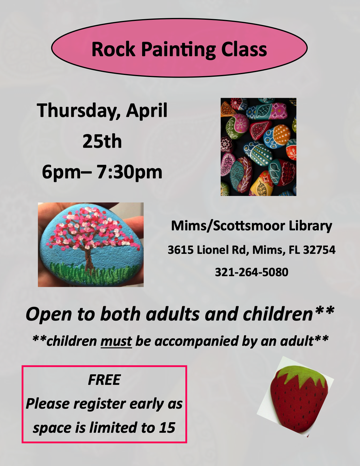 Adult programs/Book Clubs/Crafts: Throughout each month. 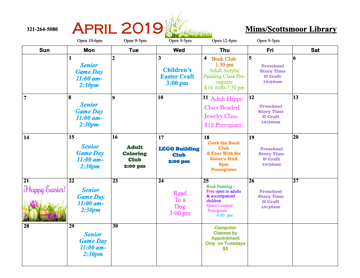 Children's story times and special activities: Throughout each month. PRINT & SHARE this information.